On August 16, approximately 9:00 p.m., the Wyoming Fire - EMS was dispatched to a structure ﬁ re on Chisholm Trail. The fire originated in an attached, two car garage and quickly spread to the roof of the structure. Wyoming Fire Lt. Peter Hauser, who lived four houses from the scene, struck a second alarm on his arrival less than one minute from the initial dispach. Engines 97, 297, Ladder 97, Squad 97, and Rescue 97 were dispatched on the ﬁ rst alarm bringing 20 Wyoming ﬁ reﬁ ghters and medics to the scene. The second alarm included units from Springfield Township, Lockland, Woodlawn, Reading with an additional call for relief personnel from Glendale and Forest Park. Quick work of pulling the living room ceiling saved the bedrooms and family areas. Damage was estimated at $240,000 to the house and contentsplus two vehicles totaling $10,700. Combined total of $250,700 dollars. The cause of the ﬁre was traced to several electrical issues within the residence, but one of the principle issues was that the home had a Federal – Pacific Circuit Breaker Box. Hundreds of thousands of homes constructed across the United States from 1950 well into the 1980s, were equipped with Federal – Pacific circuit breaker boxes. 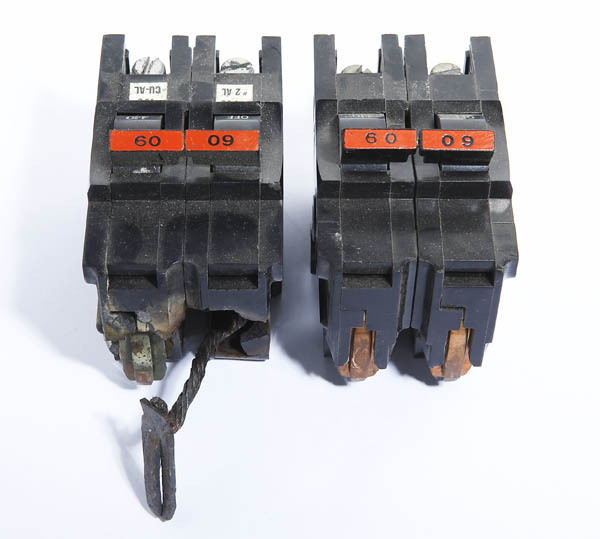 As far back as 1987, ﬁ res occurred in some of these homes with a frequency that caused Underwriters’ Laboratory to retest the Federal - Paciﬁc circuit breakers ﬁnding the majority of them to be out of compliance with their UL Standard and that of the National Electrical Code. In about 1995, the US Consumer Product Safety Commission found enough evidence of these failures that they issued an involuntary recall of the product. Unfortunately, at the same time, a class action suit brought in the State of New Jersey against the manufacturer of the Federal – Pacific home circuit breakers caused that company to declare bankruptcy. Despite the massive amount of publicity at the time, thousands of these units are still present in existing homes. In Wyoming, Wyoming Fire-EMS responds to dozens of electrical emergencies each year, and on occasion, they have found Federal – Pacific breaker boxes still in service today. Each time they have attempted to remind homeowners with houses built 25 to 50 years ago to check their electrical panel to see if they were manufactured by Federal – Pacific. If your home was built between 1950 and the mid-1980s, check your circuit breaker box to see what company manufactured the breakers and the electrical box. The Federal – Pacific label is usually very clearly visible. NOTE: If your home has a Federal Pacific Electric Panel. 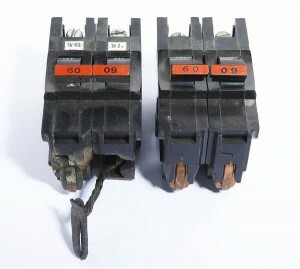 Here is a picture of a failed FPE circuit breaker on the left and what it should look like on the right. We removed these from a house just last year. It is well documented online Inspecta-Pedia and in class action lawsuits transcripts that FPE panels and breakers fail to trip during overcurrent which breakers are meant to do to protect your system. This failure to trip can cause fire. We will provide you with additional information from Electrical Inspectors and several online sources regarding this hazard. We recommend that Federal Pacific Electric panels be replaced entirely. If you would like to move forward with replacing this panel with a safer and better quality panel (with a lifetime manufacturer warranty) please do not hesitate to contact us.